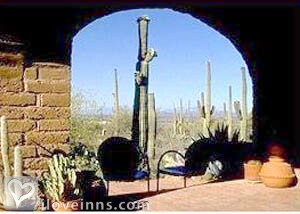 Tucson bed and breakfast travel guide for romantic, historic and adventure b&b's. Browse through the iLoveInns.com database of Tucson, Arizona bed and breakfasts and country inns to find detailed listings that include room rates, special deals and area activities. You can click on the 'check rates and availability' button to contact the innkeeper. Tucson is the second largest city in the state of Arizona. Being the main commercial hub in southern Arizona and being located near the Mexican border, makes it one of the top destinations in the state. Tucson bed and breakfast inns are often busy with guests. Tucson has a number of interesting spots that both travelers and tourists will love to see. Among these are the Pima Air and Space Museum and Arizona-Sonora Desert Museum. To catch a view of scenic canyons, visitors may go to Sabino Canyon, Madera Canyon or to Gates Pass, which is just west of Tucson. Other attractions that should not be missed are Mission San Xavier del Bac, Kitt Peak National Observatory, and Reid Park Zoo. Just within the city's main district are Tucson Botanical Gardens and Old Tucson Studios with its amazingly wide collection of vintage Western movies. By Mon Ami Bed and Breakfast. Tucson is one of the largest cities in the country and is, in fact, the second in size to Phoenix in the state of Arizona. Tucson is not just a busy business metropolis but also a tourist destination. The existence of so many Tucson bed and breakfast inns is a testament to this. The Pima Air and Space Museum, eight miles away, is considered one of the most popular destinations. In the nearby Catalina Mountains is Sabino Canyon where biking and hiking can be fun. To catch a glimpse of how Arizona looked under the Spanish then, a trip to the Mission San Xavier del Bac would be worthwhile. This is only eight miles away from Tucson. By Adobe Rose Inn. Welcome to the Real Southwest! No matter what you love to do in the great outdoors, Tucson is the place to do it. With our famed mild climate and about 350 sunny days a year, our outdoors is always open. By Inn at Civano. Civano is located in SE Tucson, a sustainable ecofriendly community with solar energy efficient homes. Several businesses include fitness center, hair salons, spas, and a coffee/juice bar. Community center activities include all residents and guests of Civano. Tucson shopping, sight-seeing, museums, recreation and guest attractions are plenty. By Inn at Civano. Tucson ranks in the top 10 for clean air and best town for trail runners. Tucson is also known as the best cycling city and the best city for triathlete training. Come visit and experience the unique flora and fauna of the Sonora Desert at Saguaro National Park and the Sonora Desert Museum, or cool off in the pine forests of the Catalina Mountains. In summer, the Sonora Desert Museum offers evening hours to view the Tucson desert's nocturnal plants and wildlife. Visit the Tucson Botanical Gardens, the annual El Dia De San Juan Fiesta, Casino Del Sol's AVA Ampitheater with entertainers in an open-air venue, and the Tucson Jazz Society. A multitude of tours are offered to give visitors the Southwest experience. These include missions and churches, military history featuring Spanish conquistadors, bird watching and astronmy at some of the world's highly regarded observatories.Tucson has so much to offer, it takes more than one visit to enjoy it all. By The Inns at El Rancho Merlita.